It’s all in how you play the game. Those words may ring true for gamblers on the Strip, but they also applied to economic students at The Meadows School. 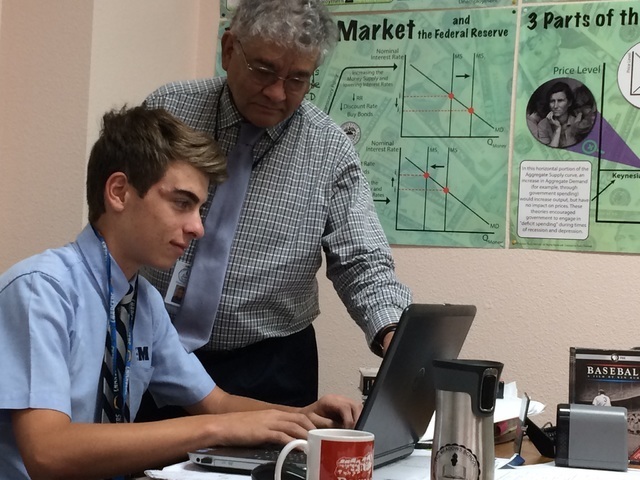 Students in Dr. Miguel Enriquez’s Introduction to Economics class learned about the stock market with the My Market Watch game, an online trading simulation that gives each player a set amount to invest. It’s all in how you play the game. Those words may ring true for gamblers on the Strip, but they also applied to economic students at The Meadows School, 8601 Scholar Lane. Students in Dr. Miguel Enriquez’s Introduction to Economics class learned about the stock market with the My Market Watch game, an online trading simulation that gives each player a set amount to invest. At the school, playing the game came with a warning. “If you don’t know the rules, you’ll lose every time,” Enriquez said. Blake Wynn, 16 and a sophomore, must have listened. At the end of the semester, he ended up taking the grand prize of the final game, $300. He won by taking his original $500,000 stake and growing it by more than $300,000. Getting to that point took learning the game. The first few weeks of the class introduced the students to the basics and got the students used to how to trade, allowing them to make mistakes so the lessons would stick. Then, beginning about Feb. 1, the ante was upped. They were “given” money with which to trade, and the students began playing the game in earnest. Early games saw students win modest cash incentives provided by Enriquez, and the ante kept going up: Renzo Iannuccilli won $50 in the first game; a female student who did not want to be identified won $100 in the second; and Ben Goodman won $150 in the third. Enriquez recalled how Goodman took an unusual strategy. The students talked about their trades outside the classroom and were so enthusiastic that four students approached Enriquez and asked to participate, which he allowed them to do. Wynn called the class fun and said Enriquez explained stock watching better than his mother, Dale Wynn, a day trader, had tried to convey to him. He said with each game, he became more stock- savvy. To demonstrate to the students what would happen if they simply let the money ride, Enriquez took his $500,000 and let it sit, not trading it at all. It ended up earning $245.95. A dozen of the students ended up making money. But even the ones who lost money, Enriquez said, learned lessons. Wynn made approximately 780 trades and ended up growing his half million to $806,000, nearly half a million higher than his closest competitor. He said he did it by honing his portfolio to a handful of stocks. He set his alarm every day for 6:30 a.m. to check the market and kept an eye on things until the last bell. The class also included making a business plan. Wynn has had his own small business since he was 12. He’s been traveling the country ever since to various trade shows to sell. He said he’s a top-rated seller on eBay. One of his sales was for a $5,000 pair of shoes.